BUHAGIAR. On March 20, JOHN BAPTIST of Siġġiewi, passed away peacefully, aged 86, comforted by the rites of Holy Church. He leaves to mourn his loss his son Dion and his wife Denise, Joseph and his wife Marianne, and his beloved grandchildren Kenneth, Kristina, Roberta and Andrew. Mass præsente cadavere will be said tomorrow, Saturday, March 23, at 3pm, at Siġġiewi parish church, followed by interment at Siġġiewi cemetery. No flowers by request but donations to Id-Dar tal-Providenza, Siġġiewi, would be appreciated. Lord, grant him eternal rest. BUHAGIAR. 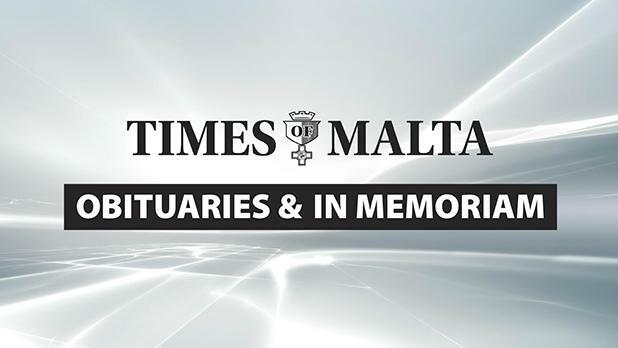 On March 20, at Mater Dei Hospital, MELITA, née Borda, of Sliema, aged 99, passed away peacefully comforted by the rites of Holy Church and surrounded by her immediate family. She leaves to mourn her loss her beloved daughter Marie and her husband Godfrey Demicoli, her grandson David and wife Rebekah, her granddaughter Kirsten and husband David Darmanin and her great-grandchildren, her sister-in-law, nephews, nieces, cousins, other relatives and friends. The funeral cortège leaves Mater Dei Hospital today, Friday, March 22, at 1.30pm, for St Gregory the Great parish church, Sliema, where Mass præsente cadavere will be said at 2pm, followed by interment in the family grave at Santa Maria Addolorata Cemetery. No flowers by request but donations to Id-Dar tal-Providenza, Siġġiewi, will be greatly appreciated. Merciful Lord, grant her eternal rest. The family would like to thank nurses and carers at Casa Antonia, Balzan, for their care and dedication during the many years she spent there, as well as doctors, nurses and carers at Mater Dei Hospital, Orthopaedic Ward 3. CALLEJA GERA. On March 21, LINA, née Anastasi, aged 86, widow of Francis, passed away peacefully, comforted by the rites of Holy Church. She leaves to mourn her loss her children Jennifer and her husband John Cassar Aveta, Angela and her husband David Pace O’Shea, Sandra and her husband Thomas Schmitt and George and his wife Enid. She also leaves to mourn her loss, her grandchildren Ann and Simi, Neil and Vanessa, Gail and Andre, Fleur and Andrea, Debbie, Hanna and Max, Julia, Nathaniel and Cristina and her great-grandchildren, Beatrice, Aurora, Francesco and Mya. Also, her siblings John, Pauline and Pio. Her sisters-in-law, Rita Bonello and Lina Calleja Gera of Canada, nephews and nieces, other relatives and friends. Funeral arrangements will be announced later. CASSAR. On March 20, EDWARD, of Sliema and residing in Wardija, aged 66, passed away peacefully comforted by the rites of Holy Church. He leaves to mourn his loss, his son Sean and his wife Amanda, his mother Jane, his brothers and sisters Albert, Anna, Tony, Henry, Richard and Vicky, their respective spouses, his nephews and nieces, other relatives and friends. The funeral leaves Mater Dei Hospital, today, Friday, March 22, at 1.30pm, for St John of the Cross parish church, Ta’ Xbiex, where Mass præsente cadavere will be said at 2pm, followed by interment in the family chapel at Santa Maria Addolorata Cemetery. No flowers by request but donations to Id-Dar tal-Providenza, Siġġiewi, will be greatly appreciated. Lord, grant him eternal rest. CASSAR. On March 22, at Mater Dei Hospital, DORIS of Sliema, widow of Saviour, aged 87, passed away peacefully comforted by the rites of Holy Church. She leaves to mourn her loss her children Frank and his wife Monica, Marlene Cassar and Twanny Spiteri, her grandchildren Andrè, Ruben, Diana, Amanda and John, their respective spouses, her beloved great-grandchildren, her in-laws, nephews and nieces, relatives and friends. The funeral cortège leaves Mater Dei Hospital tomorrow, Saturday, March 23, at 1.30pm, for Sacro Cuor parish church, Sliema, where Mass præsente cadavere will be said at 2pm, followed by interment at Santa Maria Addolorata Cemetery. Lord, grant her eternal rest. GRECH. On March 21, at Villa Messina, Rabat, VICTOR of Sliema, aged 88, passed away peacefully. He leaves to mourn his loss his wife Helen, his children Maria, and John and his wife Elaine, his grandchildren Pia and Mattea, his brother Michael and his family, in-laws, other relatives and friends. The funeral Mass will be said tomorrow, Saturday, March 23, at 2pm, at Stella Maris parish church, Sliema, followed by interment at Santa Maria Addolorata Cemetery. No flowers by request but donations to Id-Dar tal-Providenza, Siġġiewi, will be greatly appreciated. Lord, grant him eternal rest. D’AGATA. In everlasting memory of our dearest MARCO on the 16th anniversary of his death. Never forgotten by his daughter Rebekah, his sisters Ria and her husband Frank and Didi, his nephews and niece Alex, Nicholas and Martina. FALZON – PETER. In ever loving memory of our dear father, today the 59th anniversary of his demise. Always in our thoughts and prayers. Yvonne and Wilfrid, in-laws and their families. FARRUGIA – CONNIE. In loving memory of a dear mother. Sadly missed by Katheen, Moira and families. MAHONEY – OLGA. In everlasting memory of a dear mother, today, the 14th anniversary of her demise. Fondly remembered by her children, in-laws, nephews and nieces. Always in our thoughts and prayers. PULLICINO – ALFRED. In loving memory of a much loved father. Deeply missed and always in our hearts. The family. SANT – MATTHEW JOSEPH. Remembering with love and gratitude a dear father and grandfather on the 31st anniversary of his demise. May he rest in the peace of the Lord. His children Ann, Rose, Godfrey, Edward, Tony, Joan and Marie, and their respective families. SCICLUNA – ANGELA. In loving memory of a cherished mother, grandmother and great-grand­mother on the 24th anniversary of her demise. Always in our hearts and prayers. Remembered with love by her children Fr John Scicluna SJ, Marlene widow of Chev Carmel Scicluna, Joe and his wife Jennifer, May and her husband Eddie Balzan, her grandchildren and great-grandchildren.